Federal judges consistently override Congress, redefining statutes after they are passed , and they have unilaterly eliminated jury trials, changing your Constitutional rights and access to justice. Even more defiant of democracy, they have created for themselves, an impenetrable, self-serving franchise, that has become steeped in secrecy and corruption. One federal judge that most people never heard of, is in control of all of the judicial misconduct complaints that come from across the country. Pennsylvania Federal Judge Anthony Scirica, an Italian American, has been Chair of the Judicial Conference Committee on Judicial Conduct, located in Washington, DC. since its inception in about 2008. He is fighting against Congressional oversight of the Judiciary. In the video below, at approximately 12 minutes in, you can listen to Scirica’s assault on Democracy, as he continues to fight against a bill that Congress has introduced every year since 2006. This ongoing effort to install an Office of Inspector General over the Judicial Branch, has never passed because so many members of Congress have law firms whose revenue depend upon the favor of these federal judges- and Judge Scirica is there to remind them. It has been a huge conflict of interest at the expense of the public welfare. Herein lies the reason the Judiciary is being exempted from scrutiny. It is ironic that Scirica hails from the most corrupt state in the nation, whose courts are known to be infested with organized crime, allowing the Kids for Cash Scandal and the Penn State Sandusky cover-up to continue for almost a decade. The Commonwealth also holds the national record for having the most Supreme Court judges removed. So it is no wonder 99.99% of judicial complaints are dismissed. There is no protection or restitution whatsoever, for the public against rogue judges. Scirica’s own 2012 Financial disclosure, improperly redacted the source of a free “teaching” trip to Florency, Italy. Yet in the video, he pontificates about while other judges may improperly accept au gratis accommodations, his Conduct Committee has been effectively self-monitoring these problems. Scirica was a State Representative and then appointed as Common Pleas Judge in Montgomery County- where he was friendly with the late U.S. Senator Arlen Specter. 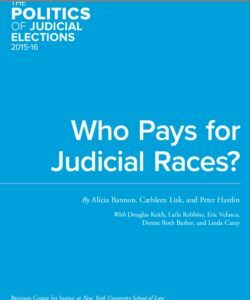 Like so many federal judges, they are political appointments gained by paying into campaign funds. Scirica is certainly one of at least 20, who obtained their positions from Specter, who was the second longest running Senator in the nation’s history. This created a petri dish for corruption in the state of Pennsylvania. It is no wonder Specter’s son’s law firm of Kline Specter, LLC is the wealthiest in Pennsylvania from dubious insurance cases with outragous settlements- which they dutifully share with politicians. This association with so many judges has not gone unnoticed. You will be hard-pressed to find similar successes, except for their former partner and son of a former governor, the law firm of Matt Casey. If you want to know why your health and other insurance is so high, go knock on the doors of one of their multiple million dollar vacation and primary home mansions. America is clearly ignorant that, in fact, contrary to this diatribe about the need for “independence” by Judge Scirica, it is the Judiciary that has continually encroached on the power of the other two branches of government. It is not Russia or Putin that is the problem- it is the legal industry and its unrestrained assault on this country. It is time to demand a Congressional Inquiry into the federal judiciary, to see exactly what terrible transgressions against Americans they have been hiding. I am VERY concerned about the injustices within the judicial system based here is my own state of Pennsylvania. I am involved in a civil case and I already can predict by the way I have been treated (although my case involves blatant fraud on the part of the very wealthy plaintiff) that the Judge Gail Weilheimer will be ruling in the large corporations favor. I am actually Pro Se and no one will take my case even though I have said I will pay. I have been threatened by Gail Weilheimer in her chambers that if I didn’t do at the time what she wanted, that she would schedule the bench trial the very next day or actually during the week because she was “free all week”. I knew what she was saying was false and illegal (a citizen gets 30-60 days to prepare their case for trial but she scared the heck out of me although I now know I should have taken her up on it. If there are any groups out there that are forming or are in progress, I would like to be a participant since I believe that this law they passed in 1995 as to no one is watching the fox den is outrageous. Gail Weilheimer is a disaster. But the biggest problem is the Judicial Conduct Board is controlled by organized crime. The state of California isn’t any different. The California Judicial Performance that is to overlook judge complaints have hardly ever removed a judge. Persky got removed because of citizen outrage. But he’s only one of many that wouldn’t know due process if it bit them on their noses. CA. civil courts only give trials when its Inc V Inc. The real individual citizens cannot access due process in any court in California. Only illegals have rights and thanks to Eric Holder, ex U.S.AG. with being paid as a consultant by Jerry “moonbeam” Brown, to write up laws for illegals, sanctuary state, against the U.S.Govt AG. illegals do have rights and NOT those who are born here OR become legal. CA. state real citizens do not have chance at any of their civil rights, and that loss starts in the CA. workers compenstion “courts” where there are NO constitutional rights whatsoever! AND the upper state courts rubber stamp each citizens with a legit case into oblivion. It is a ottal travesty as to what is really happening and why in the U.S.A , all for crooked politicians who are beholden to corporations and their partners, the insurance industry and WHO runs all of that???? It’s address is in, wait for it, Boca Raton FLORIDA! Yep, and guess wo all lives there and conducts illegal business from? ?